Manager Neil Lennon insists he will not step down from his post at Bolton Wanderers, despite a run of nine games without a win this season. The Trotters are third from bottom in the Championship, with the lowest goals tally in the division of 10. 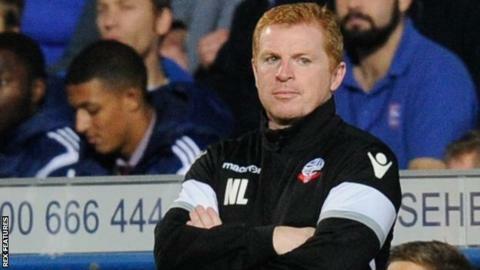 Bolton continued their winless run in Tuesday's 2-0 defeat by Ipswich Town. "I'll never quit. People say managers lose the dressing room, but they've got to worry about losing me," Lennon told BBC Radio Manchester. "I'm here to fight it out, if the people at the club or the fans want a change, that's something I can't control. "I don't feel under any pressure, but with performances like that people will look at you and ask if you're doing enough, and that's the first question I ask myself after every game." Lennon has tried to bring in new faces to freshen up his side, with midfielder Luke Brattan joining on loan from Manchester City and former Newcastle United forward Shola Ameobi signing a short-term deal, but further options are limited because of the money available. The loss to Ipswich was a backward step following a goalless draw with Preston at the weekend. "I can't change personnel, we've tried to, but the finances aren't there, so we have to work with what we've got," Lennon added. "We go from playing pretty well on Saturday evening to looking like total strangers, that's the most bewildering thing about the whole process. "There's a lack of consistency, there's enough experience in the team, there should be enough hunger but the basics of defending weren't there, if we play like that we will get beaten."